Welcome to the Made with Love dinner party. Sit down, relax. Heck, take your shoes off if you want to. After all, it's a virtual dinner party, so I won't know if you have holes in your socks. Today, everyone in the party is cooking from one cookbook. Fun, huh? The Made with LoveLThe Meals on Wheels Family Cookbook is a compilation of recipes from everyone from politicians to entertainers to chefs, and the recipes range from complicated to simple to semi-home made. When I was going through the book looking for something to make, I originally decided to make a pasta recipe from a congresswoman from connecticut. I love pasta. And it looked really appealing. Then I saw this recipe for grits souffle. I love grits more than you'd expect, considering I was born and raised in the midwest. This recipe includes two types of cheese, which is always a bonus. Besides sending me a copy of this book for my use, the publisher is also offering a copy to one of my readers. Instructions on how to enter are below the recipe. Preheat oven to 350 degrees. Use butter to grease a 2-quart baking dish or 4 6-ounce ramekins. Bring water to a boil in a 2-quart sauce pot over medium-high heat. Reduce heat to low and gradually whisk in grits, continuing to whisk to eliminate any lumps. Cover the pot with a lid, and cook until water is absorbed and grits ar creamy, about 10 minutes. Remove from heat and transfer grits to a large mixing bowl. Stir in butter, cheddar cheese, and salt until combined. In a separate bowl, whisk eggs and milk together until combined, then add to grits, whisking until well mixed. Pour entire mixture into prepared dish or ramekins. Sprinkle with parmesan cheese and (optional) paprika. Bake uncovered in preheated oven until top is golden and toothpick inserted in center comes out clean, about 45 to 60 minutes in baking dish and 30 minutes in ramekins. Serve immediately. 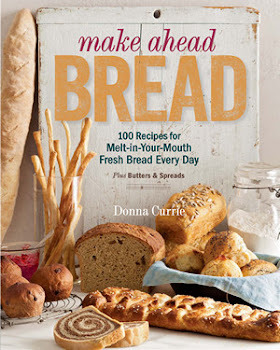 Want to win a copy of the cookbook? Leave a comment telling me if you've ever had grits, and if so, how you like to eat them. For bonus entries, you can do any of these you like. Pin a photo from this post to Pinterest, then leave a comment here telling me you've pinned. Stumble this post, then leave a comment telling me you've stumbled. And that's it. One comment to enter, and three extra ways to enter, if you want to. giveaway ends Dec. 26 at midnight, mountain time. The usual Cookistry contest rules apply. 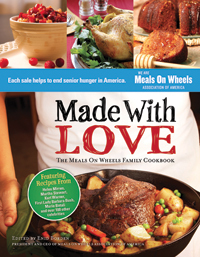 You can find the Meals on Wheels cookbook on Facebook and on Twitter.